Caves challenge our bravery. Dark winding passages can hide any danger. Dangers are abundant, bat guano in large amounts can create ammonia to levels that can cause an adult to lose consciousness. It’s easy for the unwary to hit their head on rock ceilings or trip on uneven floors. Once a flashlight runs out, a cave becomes a vast maze navigated in pitch blackness. Caves can also be a place to hide from danger. Crocodiles hiding in caves sound like a dragon myth replete with human skeletons littering a dark den come to life. Cave dwelling crocodiles are a reality, though. But the reason crocodiles live in caves may have more to do with hiding from danger than lurking in the dark waiting for unwary prey. Throughout Africa, the bushmeat trade as well as trades in crocodile skin have devastated a once healthy crocodile population. Fear of the reptiles only makes the situation worse, even for the relatively tiny African Dwarf Crocodile which reach a maximum length of less than two meters. Such pressure from human hunting may be the driving force behind some crocodiles in Africa taking shelter inside caves. Luckily for crocodiles, local people in Africa are often reluctant to enter caves. In Gabon, research on cave dwelling crocodiles is still in its infancy. Cave dwelling crocodiles in Madagascar haven’t yet been researched in any real way. 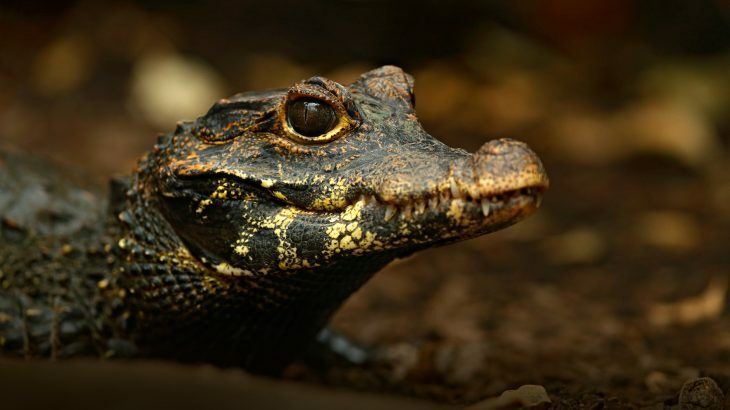 In Gabon, researchers first noticed what appear to be African Dwarf Crocodiles in the Abanda cave system in 2016, National Geographic reports. The crocodiles live in pools with large amounts of bat guano in them. The guano seems to bleach the skin color of the older crocs to a strange orange-ish hue, which is strikingly different from the more common green/brown color. The crocodiles also seem to eat mainly bats as opposed to the mostly fish diet of their non-cave dwelling relatives. Scientists believe that young crocodiles can come and go from the caves small openings at will, but once a croc grows to a certain size, it may be trapped in the subterranean ecosystem for the rest of its life. Researchers have found real genetic differences in the cave dwelling crocodiles which suggests that they’ve been evolving differently from the top side African Dwarf Crocodiles. Interestingly, outside of cave environments, the African Dwarf Crocodiles are also nocturnal, making the transition into cave living relatively straightforward. But there are still many unanswered questions about the crocodiles. Scientists have no knowledge of how the crocodiles mate. If after growing to a certain length, the crocodiles are truly trapped in the cave environment, it puts real restrictions on reproduction. In most African Dwarf Crocodiles, vegetation is an important part of nest material. Crocodiles are ectotherms or ‘cold blooded’, so they rely on decay from plant material and other methods to regulate nest incubation temperatures. Inside caves, there isn’t much available plant material for a crocodile to use for nesting. Perhaps the crocodiles have found a way to leave the cave for breeding, perhaps they are incapable of breeding after reaching a certain size. More interestingly, it’s possible that the cave crocodiles actually nest inside the caves, a possibility that has yet to be observed. Even more mysterious are the cave crocodiles of Madagascar. Madagascar is a place with a large human population and a related pressure upon the island’s wildlife. People hunt crocodiles in Madagascar for the same reasons they do elsewhere in Africa and the rest of the world – for food, money and safety. Ankarana Reserve in Madagascar has crocodiles hiding in caves, but it’s uncertain whether they spend as much time underground as those in Gabon. The New York Times Scientist at Work column reports that ichthyologist John Sparks investigated the crocodiles informally. Dr. Sparks had been studying cave fishes in Madagascar when he first encountered the cave crocodiles. Unlike the crocodiles in Gabon, those of Madagascar are Nile Crocodiles (Crocodylus niloticus), a much larger species. The cave with crocodiles yielded no interesting cave fishes for research but is waiting for a crocodile specialist to carry out research. It could be that these crocodiles too are undergoing subtle evolution different from above ground crocodiles in Madagascar. Various accounts of the caves in the region say that there are various habitats within the cave system from dry guano beds to blue pools and even ‘sunken isolated forests’. It sounds like a mythical underground world separate from the above ground like Madagascar is separate from the rest of the world and still connected. Bat guano in the caves supply a rich source of nutrients for animals like fishes and shrimp that the crocodiles could in turn feed upon. The longest cave in the system, Ambatoharanana ‘crocodile’ cave, is 18 km long, big enough for many crocodiles to hide in. Some other caves in the system are also quite large, as long as 10 to 11 km. Much like the dwarf crocodiles in Gabon, little is known about how exactly crocodiles utilize the caves in Madagascar. The caves likely keep crocodiles from being killed. There was a species of crocodile, Voay robustus, endemic to Madagascar. Tellingly, the crocodile is thought to have gone extinct shortly after humans arrived on Madagascar roughly 2000 years ago. As with many aspects of Malagasy culture, there are many different perceptions surrounding wildlife in general and crocodiles specifically in different parts of the island. Mada Magazine reports that there is a village in Madagascar where the locals make sacrifices of zebu (a type of cow) meat to crocodiles connected mythically to their ancestors. Despite this, there are also Malagasy that are quick to kill crocodiles and this pressure might be driving the reptiles underground to become a different type of animal.